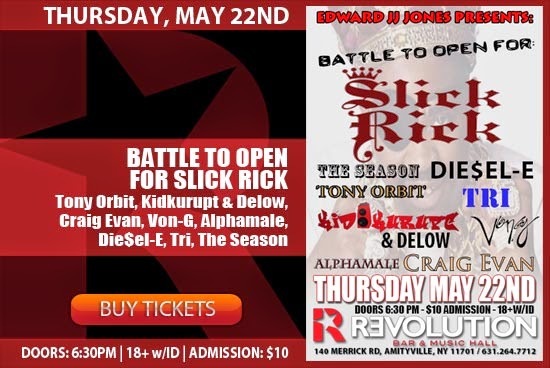 Newsday reports seven unsigned Long Island rappers — Tony Orbit, Tri, The Season, Craig Evan, Die$el-E, Alphamale and KidKurupt — will battle tomorrow, Thursday May 22, 2014 at Revolution Bar & Music Hall in Amityville. The winner will then open for Slick Rick on the following night at the same venue. Read the full story here and if you're interested, cop tickets to the events here.